Saturday, August 18th is National Honey Bee Day! Honey bees are the almond grower’s best friend so we need to celebrate! We bring honey bees into our almond orchards every year because every almond you eat exists only because some sweet bee pollinated an almond blossom. And the bees benefit, too! Almond blossom nectar provides them with their first natural food source each year so they get a healthy start to their pollination season. Honey bees are actually responsible through pollination for 1/3 of the food we eat. So beekeepers, beekeeping clubs and associations, and honey bee enthusiasts all over the country use the third Saturday in August to bring attention to the importance of keeping the bee population safe and healthy. And that’s something Maisie Jane’s has been seriously committed to supporting. Want to read an interview with one of our beekeepers? Line a large baking sheet with parchment paper. Grease the paper lightly and set aside. Melt the butter in a large nonstick skillet over medium heat. Add the honey and salt. Bring to a boil. 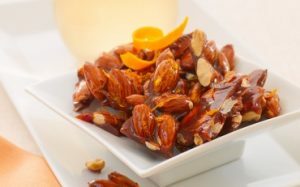 Stir in almonds; cook, stirring constantly 10 to 12 minutes or until honey becomes a dark caramel color. Stir in orange zest and quickly spread nuts in a single layer onto the prepared baking sheet. Cool until you can handle them the nuts. Then break the honeyed nuts apart. Cool completely and enjoy! If you have any leftovers, store them in an airtight container.